in it's worst form: Not In My Back Yard but fine in someone else's! suppliers that do not use dangerous and polluting methods of production. "In focusing solely on the potential seismic effects of fracking, this report tells us nothing about the wider environmental impact of shale gas exploration - nor about the consequences of a new dash for gas on the future of renewable energy or on action to combat climate change. Growing evidence from the US suggests that there is serious cause for concern around water and air pollution caused by fracking. Legitimate questions are now being raised by communities here in the UK around the effects on the local environment and on water resources, which are already stretched to capacity in many places. People living near to fracking sites deserve real answers, especially since a Tyndall Centre report cast doubt on the adequacy of current UK regulation to prevent groundwater and surface water contamination." The Brighton Pavilion MP continued: "Even aside from the local concerns, it's clear that shale gas is a last gasp of the dinosaur fossil fuel industry at a time when we should be moving towards a truly green economy. The UK is the richest country in Europe in terms of renewable energy potential, but this new focus on gas threatens to displace investment in those renewables, making it even harder to achieve our renewable energy targets and grow this jobs rich sector. It's also clear that large scale extraction of shale gas poses a real risk to our climate change commitments. We have a very short time to reduce emissions to levels consistent with the science, yet a number of studies have shown that the overall climate impact of shale gas is probably as great as that from coal. "If carbon capture and storage technology is not in place, burning just 20% of the gas which Cuadrilla claims to have found in its licence area in Lancashire would generate 15% of UK's total CO2 budget to 2050. And despite claims from gas lobbyists that shale gas will bring down energy bills, we know from Ofgem and DECC that recent energy bill rises resulted mainly from high gas prices, while analysis from Deutsche Bank and Poyry concludes that the impact of shale on bills would actually be low. I therefore urge the Department for Energy and Climate Change to recognise that today's report does not tell the whole story, and to seriously reconsider its policy on shale gas in the UK so that we can finally make the genuinely green transition that will deliver both energy security and a cleaner environment." That this house believes a moratorium should be placed on onshore and offshore exploration, development and production of Coal Bed Methane, Shale Oil and Shale Gas by withdrawing UK licences for hydraulic fracturing (fracking), at least until the publication of a detailed Environmental Impact Assessment into the practice; notes that hydraulic fracturing can cause the contamination of local water sources such as aquifers, which provide about 30% of the UK's water; further notes that amongst a variety of adverse environmental impacts, the process of fracking can cause serious well blowouts, which put both workers and local communities at risk; does not consider that the production of hard to reach fossil fuels is compatible with efforts to achieve the statutory UK carbon budgets; and, therefore, urges the Government to instead give greater support to the generation of energy from renewable sources. Steven said:"The music industry is now dominated by big companies churning out insipid rubbish, while genuine musicians are overlooked and local music scenes are dying, or being forced to conform to the industry's idea of music. The X-Factor is almost guaranteed a Christmas No.1, making millions for Simon Cowell and songwriter Gary Barlow, regardless of who wins. This campaign will be a massive effort to tell Simon and the industry in general that there are still people out here who know what real music is!!" Steven also plays drums for Slam Cartel, who are currently promoting their debut album 'Handful of Dreams', without signing to any record labels. They can be seen playing live, (ie: NOT to a backing track!) at Ashford's Club Q on 12th November and London's Rhythm Factory on 18th November. Matt Stanley, Ashford Green Party. Tommorow in the UK, there is a local election, and also a referendum on the Alternative Vote. Here's a Wikipedia page for it. The Green Part recommend voting YES. Please do the same. This is the first time the voting mechanism in the UK has been subject to a referendum. This opportunity will never come again. It is a case of Now, or Never. The AV system may be imperfect, but it is certainly far better, and far more representative than the skewed First Past The Post System. If you vote "No", you're voting for a lifetime of gruel because you didn't get the EXACT cake you wanted. In the UK, MP's get can elected with less than one person in five voting for them. They can be elected, practically for life. In one constituency, it has been held by the same party for 110 years - apart from when an independent clergyman ran in the 1920's. That vote is worth nothing. Stephen Fry - or Brian Cox - could run in this constituency, and if they weren't in that party, they'd lose. That vote is worthless. (Check yours here at the Voter Power Index). The First Past The Post system is fundamentally flawed. It only ever allows the largest single minority to win. It is blunt and crude. 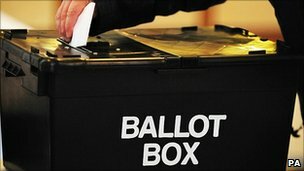 In UK elections, where for example, most of the time, less than two thirds of the population actually vote - and therefore 20,000,000 don't, the First Past The Post System can see a person elected on less than 30% of the vote (Norwich South in 2010 won on 29.5% of the vote). Only 1 person in 5 then, actually voted for the MP for Norwich South. Is this fair? Is this democratic? Is this the system that Cameron calls fair and simple? AV is no more complicated for X-Factor.. You rank your candidates in order of preference. If you think AV is complicated, you are underestimating yourself. If you think First Past The Post is fair and right, you should realise democracy is not about a "winner", its about representing the wishes of the people. First Past The Post is only fit for Sports Day. All the parties that support AV are those that are under-represented in Parliment. The current system polarises and simplifies political debate to Labour, Conservative, or Lib Dem. If you do not agree with their policies, you have no voice in our democracy. And plenty of people now have to exercise that complicated electoral doublethink in politics - knowing that the FPTP process does not work - so that they do not vote for who they want, but against who they do NOT want. Is that fair and simple? Not at all. The parties that oppose AV are The Conservative Party. They know they do not represent the wishes of the majority of the country, but the largest single minority. Give yourself a voice. Let democracy actually work and represent us, instead of giving the largest minority all the power. Democracy isn't a race or a sport, and unless the people win, there is no winner at all. Keith Taylor, Green MEP for Kent and the South East has given his support to protesters campaigning against a proposed expansion of Lydd Airport in Ashford, Kent. On the day that a public inquiry begins into the expansion, he vowed to write to the Secretary of State to voice his objections. Nearly 14,000 people wrote to the Government Office for the South East to request the expansion plans were called-in for a public inquiry. Keith said: “The large number of people that requested a public inquiry into the expansion of Lydd airport shows that there are huge concerns about the impact these proposals would have in terms of the increase in pollution for local residents and the threat to important wildlife. “Dungeness peninsula is one of the most important and sensitive wildlife habitats in the UK. The airport’s expansion will have an impact outside the immediate locality, damaging internationally protected wildlife sites. “From what I can see, the decision of Shepway councillors to dismiss their own officers’ recommendations to reject the proposal was not based on any sound reasoning. Like many others, I welcome the public inquiry to examine that decision-making process. The inquiry starts today at Shepway Civic Centre in Folkestone and is expected to run for 13 weeks. Currently the government owns the land which means we own the land, as everything the government owns is paid for out of our taxes. In other words they are selling off something you own without consulting you, and those of us who are saying 'no' are being ignored. The private owners can then fence off land to stop public access to it, land that we and our ancestors have had access to for thousands of years. The Crow Act means that we can 'gain access' to this land and they cannot do us for trespass, but they can make it as difficult as possible and can prosecute you for damage to their property if you damage the fence while climbing over it. This of course, doesn't take into account what hippies like myself call 'inherent value', which basically means the land exists for itself, as do we all, whatever species, not for our usefulness to others or the capitalist machine. If the land belongs to the government it belongs to everyone, thus it belongs to no-one, it belongs to itself, and that is as it should be. The Woodland Trust has already stated that it cannot afford to buy enough woodland to make any difference, so the National Trust are probably in the same position. Also, the woodland will be sold in auction, so well meaning trusts and individuals will be priced out by rich developers. Even if we had the cash we could still be out-bid. In the greed of man"